What happens when I don't hike for about 2 months or so? Walk over to the deep end of the pool and climb the tallest diving board and make a triumphant return to Hawai`i hiking! That's exactly what I did on this hike... an 18 hour hike over 17 miles of trail! Since I am playing connect the dots with the Ko'olau crest, I've managed to add yet another segment to my slowly but surely goal of completing the entire Ko'olaus from Pupukea to Makapu'u. We hiked up Waimano Ridge, made the cross over along the crest to the terminus of Aiea Ridge and descended that ridge back to the Aiea Loop Trail. Sounds easy right? What I didn't realize was the amount of time that would be required for my snail hiking pace. Also my hiking shoes were so damaged beyond recognition that I wondered if they would last this brutal 17 mile hike. The very first hike ever with these shoes was the Awa`awapuhi Trail in Kaua`i, back in 2009. After staging cars on both ends, Steve, whom I met for the first time from Leslie Merrell's "O`ahu Hikers & Adventurers", we started our long 7 mile walk on Waimano Ridge Trail at little past 6am. Since this is a graded trail, it is a gradual ascent to the Ko'olau crest. The funny thing was that a week ago from this day, I took Mabel and Francis up Waimano Ridge Trail and we missed the continuing contour trail from the Boy Scouts picnic shelter. There is a trail that continues directly mauka beyond the table and it is very easy to mistake this as the contour trail. The result was us plowing through head high uluhe up and down rollercoasting hills. Since it was nearly 3 years since I've last done Waimano Trail, I thought maybe aliens have rearranged the landscape. =) This trail ends at a metal stake with "R-1" enscribed on it. The trail dead ends here. FYI for future hikers on the Waimano Ridge Trail, if you decide to take a break at the picnic table, make sure to backtrack about 10 or 20ft and you will easily spot the contour trail. Do not proceed beyond the table as this gains the crest of the ridge. Waimano Trail is a graded trail all the way to the summit. Steve was not liking the weather as we were continually pelted by fast moving rain showers. The rain squalls came one after the other, as if a never ending train. I scanned far ahead, looking for a summit ridge but heavy dark clouds obscured it. I told Steve that Hawaii weather can change in a heart beat. "If you don't like the weather, wait 5 minutes." The weather really didn't change in 5 minutes but as we got closer to the summit, the clouds began to rise and break up. Soon the sun poured it's light through the broken clouds. Five minutes before reaching the summit, blue skies took over and the views were grand to leeward. We reached the summit at around 10am and took in the windward expanse. Directly below us was Waihe'e Valley. I've hiked through this valley to visit a couple of waterfalls last year. Farther out was the Kaneohe sand bar and He`eia. Knowing we had a long journey ahead of us on the summit ridge, we didn't spend much time and off we went, going up and down like crazy on a never ending parade of pu'u. The overgrowth was bad at times, but manageable. I was attempting to look for the topping out point of Waiau Ridge but saw no signs of any ribbons or a distinct summit. We looked far ahead and noticed a gigantic grassy hill. I've read on several write ups that this grassy pu'u is the terminal point of Waimalu Middle Ridge. The climb up it was surreal. I've just never seen such a huge grassy meadow on the top of the Ko'olaus, or any mountain peak here on O`ahu. We probably reached the top of this hill at around 12:30pm and paused to take in the majestic views. The grassy plateau is so huge that it's probably the best summit camp out spot on the entire Ko'olaus. Far out, Ohulehule stood tall and proud and could see the ridges of the Kualoa Ranch in it's entirely. We barely made out True Manamana and Manana Ridge. Looking to the west was the Wai`anae Range and flat topped Mt. Ka`ala. Give me a lunch wagon, and a tent, and I could live up here forever. I looked at the time and was beginning to worry whether if we were going to make it down Aiea Ridge before nightfall. Reluctant to leave, we departed the grassy hill and continued on what could of been 8 pu'u before topping out at Aiea Ridge. I looked far ahead along the summit spine and grew even more worried with the time. After pu'u #6, we reached the Aiea "saddle" powerline tower. By this time, the sun was slipping below the horizon and the night time clouds were beginning to return to the summit ridge. Time was running out fast. By the time we finally reached the Aiea Ridge summit, now completely socked in, sunlight was just about completely gone and out came our headlamps. I proceeded to have my MRE for dinner. We were beginning to get fatigued and we still had the 6 mile jaunt on the Aiea Ridge and Loop Trail. Hiking down was very tricky to say the least. This would be my first time to hike on an ungraded Ko'olau ridge in it's entirely with nothing but a headlamp. When we got to Pu'u Kawipo`o, the helipad, the city lights came into view and it was beautiful. My shoes finally had enough, the soles of my left shoe peeled back like the cover of a sardine can and I was virtually hiking half shoe, half barefoot. We reached the junction with the Aiea Loop Trail by 11pm and we were back at the car at little past midnight to complete an 18 hour hike, the longest I've personally done. I took off my shoes at the trailhead and tossed them in the first trash can I saw and walked to the car barefoot. I proceeded to fetch my car at the Waimano Trail at 12:30am and didn't get home til 1am. I finally fell asleep at 2am with a wake up time of 7am to head to work on a 10am flight to Tokyo, Narita, Japan, another 8 hour flight. I've never slept so hard on a layover before.... about 14 hours. Ever remember watching the movie "Aladdin" back in your childhood days? Remember that Magic Carpet scene where they fly high above the desert city while the song "A Whole New World" is being played? 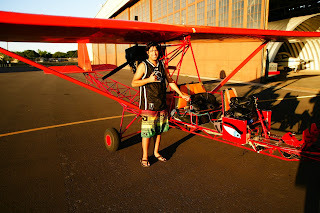 That fantasy became a reality after befriending a local pilot who owns probably one of the most bizarre looking aircraft I've ever seen in my entire life. And to take it over the island of O`ahu, making flybys of the numerous ridges I've hiked on, made for a surreal experience. Photos and videos can only show a fraction of the experience. With me working in the airline industry, flying can be a routine thing... that is when I'm trapped inside a metal tube at 30,000ft. Try getting up close and personal to the pali in a completely "fuselage-less" aircraft with nothing but your seat holding you up thousands of feet. It truly was a mind boggling experience! The aircraft is known as a "Breezy" due to the breezy conditions experienced during flight and apparently it can be constructed by anyone who acquires the blueprints from the original creator. The wings are from a Piper and rest are a tubular skeleton air frame that supports the rest. It is so light that one can push down on the tail section and the nose gear will go up. This is useful as the plane can be positioned just about anywhere by simply pushing or pulling it into tight spots that a plane would never be able to get to by conventional means of taxing. As of writing this entry, I've made two flights, one on September 8, 2011 and September 25, 2011. The first flight focused on the Ko'olaus and the three highway saddles (ATC and pilots call these formations "gaps" ex. Kalihi Valley Gap). The 2nd flight does a low flyby of the Nu'uanu Pali Lookout, causing the tourists to look up at us because this red bird has 2 big angry eyes to stare you down! If you're a green pig, I'd run! Following the Pali Lookout is a leisure cruise along the windward O`ahu coast northward towards North Shore and back over the Wahiawa Plains. To the pilot: Mahalo nui loa for taking me into a new dimension... literally! Where has the month of September gone? My last entry dates back to when I did the Kalihi Saddle over the summer. The days are getting shorter (slightly), the nights are getting a bit on the nippy side, and the U.S. mainland turns their clocks back one hour exactly one month from today (October 6, 2011), indicating that Fall is in full swing. I've been busy with work (Delta Air Lines) as I worked full time in the month of September although I did manage to squeeze in one super hike into my chaotic schedule. Back in August, towards the end of the month, we did a hike out on the west side of O`ahu. The crew on this day consisted of Gene, Marcus, Francis, Thessa, and myself. Due to local "investigations", I am not allowed to name the location of the hike, but the ridge we climbed reaches for No Name Peak. Gene dubbed this "Razor Ridge" due to some rather thin dikes encountered. 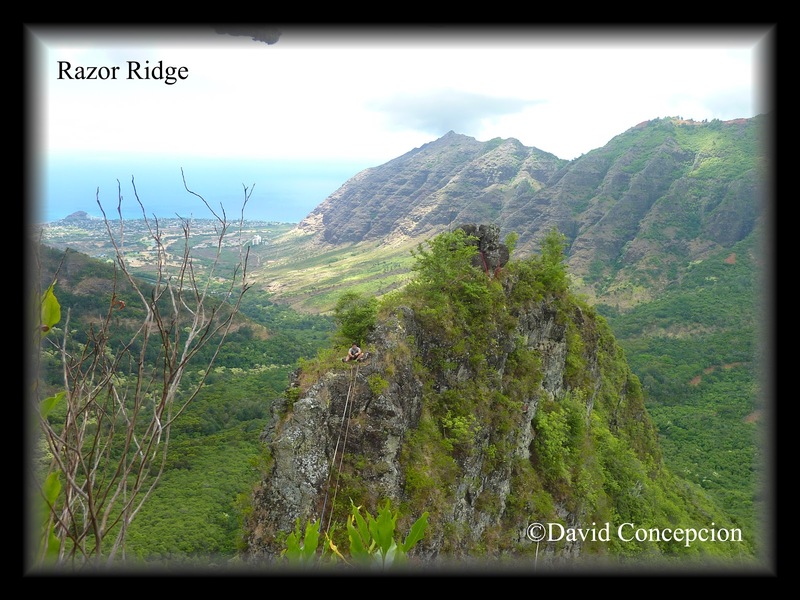 While this is no Kalihi Saddle or Bolohead Ridge, Razor Ridge can put on a good adrenaline rush. The air was absolutely stagnant as if O`ahu was stuffed inside a large canvas. It also didn't help that the humidity was sky high. Hot and sticky was the theme for the day and it would only get worse as time progressed. Nonetheless we pushed off under partly cloudy skies into a valley to gain the ridge leading up to No Name. The clouds departed and the sun began beaming down on us as we gained the crest of the ridge. The climb up wasn't that difficult, but the aforementioned weather conditions increased the difficulty factor to times fifty. At this point, I almost wanted to call it quits as I really began to bog down under the intense heat. Initially the ridgeline wasn't "razor" enough to pose an imminent danger of falling, but the further we went towards No Name, the more narrow it would get. Eventually we came across a fearsome looking notch that had to be negotiated. But to even get to the notch itself required inching our way around a block boulder that filled just about the entire width of the ridge. This was akin to the block boulder on Kawiwi'unu Ridge. Ropes were installed to help get around the boulder. Climbing up and over the boulder is an option but I wasn't in the mood to perform any aerobic jumps or stunts. I caught up to the group as they were descending into the notch one by one. Ropes were already installed to make the 30-40ft descent somewhat easier. A big drop on the ocean facing valley made us cautious during the descent. We knew the drill: big drop, crumbly rock, ropes that shouldn't be trusted. As my turn to descend came up, Marcus was just about at the top of the cliff (50ft) on the other side of the notch after free climbing it to install rope. The climb up the cliff face was tricky. The best way to attack this was to follow a indentation in the cliff face. However, the bottom half was completely smooth and finding hand/foot holds proved difficult. To make it worse, a massive drop off awaited to the right and behind you. Falling here would end someone's day very quickly. We all made it one by one up the cliff face without incident. Beyond the cliff face, the slope remained very steep with one minor rock face to scale. At the top is a false summit with a fence running through it. One could easily mistake this as the true summit but don't let it fool you. From here, one turns right and follows the fenceline towards No Name Peak, which is obscured by a hill. Once we gained the top of this hill, we saw the remainder of the entire climb. While the ridgeline was rather level, a 2nd and suicidal looking 60ft cliff face went virtually straight up to the summit of No Name. Have no fear though as this is easily bypassed by following the fence all the way to it's end, and then hanging left to pick up a contour trail that reaches for ridgeline between Tiki and No Name. Marcus wanted to look for that extra adrenaline and ended up climbing the cliff to gain No Name and proceeded to meet us at Tiki. Gene, being on a timely schedule with work, had to descend early ahead of us while we took a well deserved rest by the mammoth boulders making up Tiki. Instead of following the ridgeline from Tiki to Three Poles (W-K Trail), we went north north west to descend back into the valley we came up from to complete the hike as a loop. About halfway down, we lost the trail and ended hiking back down via a very wet and slippery gulch. At this moment, I was already feeling the effects of heat exhaustion and was not able to properly concentrate on my foot placement. This resulted in numerous slip and falls on the wet rocks, making for a very frustrating descent. We eventually popped out on to the valley road and headed back towards the ocean, concluding the loop hike. Will I do this again? MAYBE, if the weather is better. I would like to know the correct route from Tiki back to the valley road.